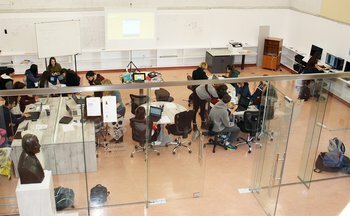 The ISCI, an acronym for "Incubator of Students' Ideas", is a student-run initiative, designed to facilitate and organize "learning projects." Participation in those learning projects allows students to take control of their learning, by giving them the chance to choose what it is they want to learn, how they want to learn it, and, ultimately, decide in what way they wish to apply the knowledge they have acquired in order to produce something meaningful for themselves and their community. Students function as architects of their own learning as they pursue, fund and support their intellectual curiosities. The ISCI is a student-centered, student-led, student-run, project-based learning initiative using the design process to promote, support and guide students’ creative ideas in all disciplines. Where is the ISCI located? The ISCI is located in the ACS Athens Learning Commons on the first floor of the Hasib J. Sabbagh library. The incubator is operational in some form during the school day and beyond. It is advised that students book the space through our email isci@stu.acs.gr to ensure access.